My daughter asked me the other day if you cut an earthworm in two will it grow back again? And will you have two worms? Suddenly the whole family is in on the act with talk of geckos tails and why we can’t grow back a limb. So to dispel a few myths and legends I thought I’d take a look for this weeks blog! CAN YOU CUT A WORM IN HALF AND GET TWO WORMS? The short answer is NO, so please don’t go trying! It is true that the anatomy of the earthworm is very different to our own and if part of a worm is cut off, one part may survive. The part that can survive is the “head” end. First let’s look at some of the unusual features of the inside of an earthworm. 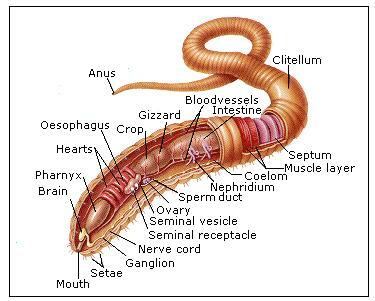 The earthworm’s body is made up of segments called annuli. These segments are stuck together just like a series of rings all lined up; each segment contains little bristle like hairs called setae and these allow the earthworm to move. Earthworms are invertebrates meaning they don’t have any internal “boney” skeleton. The earthworm does not have one heart as we do… it has FIVE! These hearts help pump the blood through the worm’s body. The worm needs oxygen just as we do but it has no lungs to fill with air, instead it has time pores on it’s skin which absorb oxygen from outside it’s body. In order for this to happen the worm needs to keep it’s body moist, which is why they often feel a bit slimy. Too much moisture though and the worms can drown; when it rains earthworms will move closer to the surface to prevent them from drowning! Earthworms have a “head” and a “tail” but no eyes, ears or nose, so they can’t see, hear or smell as we can. However their skin is covered with sensors for light and movement so thy can react to too much light (sunshine) or movement (rain falling or soil being disturbed by digging predator). SO WHAT HAPPENS IF WE CUT AN EARTHWORM IN TWO? Where in the body is the earthworm cut? The earthworm would have a better chance of surviving if it’s body is cut closer to it’s tail end. This end does not contain the vital organs. Research by Dr. Thomas H. Morgan (1901) found that the head end of the earthworm may survive if the head end contained at least 16 segments. It is possible that some of the tail end will even be regenerated. Some repair and regeneration is also possible at the head end, but usually only within a small number of segments. Chance of infection: the earthworm can pick up a bacterial infection just as we can. If the earthworm can seal the cut or regenerate the segment before infection sets in it has a better chance of surviving. The speed at which the earthworm heals: regenerating part of the body would require an awful lot of energy for the earthworm, the quicker it can heal the quicker it can get back to eating and refuel its body. If the earthworm does not have enough energy to complete the process it will die. 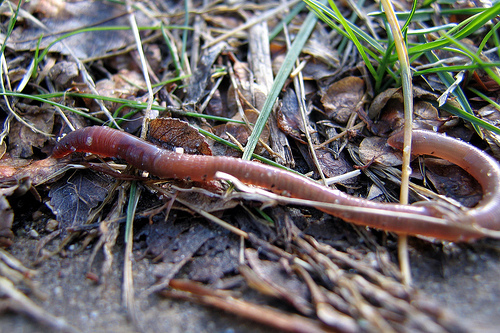 The earthworm is often called “nature’s plough” as it digs through the soil , turning and rotating as it goes. Earthworms are herbivores, they feed on leaves, root and other decaying plant matter. The earthworm deposits this matter through out the soil through its faeces. An earthworm can eat up to one-third of its own body weight in a day! The burrowing of earthworms helps the soil in two ways, it allows air and water into the soil through the channels it forms and it moves different layers and types of soil around, distributing nutrients and making the earth more fertile. Although earth worms often stay close to the surface of the soil they can burrow down as deep as two metres. A wormery (or worm farm) allows us observe the work that worms do within our soil. Fill a large see-through container with alternative layers of soil and sand. Put a layer of leaves and vegetation on the top. Collect some worms and add them to your wormery. Cover the outside of your bowl with a large piece of card or paper to block out the light. Put your wormery in a safe place and check on it every day – remember to keep adding some water to keep the soil moist. You sould notice very quickly that the different layers of soil and sand are getting mixed together, the work of the industrious worms. Remember to keep adding leaves and vegetation to the top layer and do let your worms safely back out into the garden once you have finished the experiment! Morgan, T. H., 1901. Regeneration. MacMillan, New York. Chris Maynard, 2001. Backyard Science. Dorling Kindersley, US.